Browsing the Internet one summer afternoon, I learned that Baltimore Orioles relish grape jelly. Cut an orange in half, my source instructed me, and place a dollop of grape jelly at the center of each half. Hang the halves from a branch, and you will soon have those beautiful birds in your own backyard. Enticed by that prospect, I put grape jelly on our grocery list. And before long, I found myself in Aisle 10B at Wegman’s Supermarket, searching for that elusive product. “What are you looking for?” asked a petite, white-haired lady standing nearby, as she deposited a jar of Bonne Maman Apricot Preserves in her cart. “Oh,” she sighed, visibly relieved. Meanwhile, I was imagining the Orioles in their dugout, passing around a jar of Welch’s Grape Jelly. Perhaps that image had crossed her mind as well. “What we’ve got here,” remarks Paul Newman’s Cool Hand Luke in the movie by that name, “is a failure to communicate.” In the present case, what was lacking was a context, a verbal frame around the naked fact. But as Father Richard Rohr, a Franciscan priest and writer, has observed, what is often needed in our efforts to communicate and connect with other people is not more words but fewer. What is needed, he suggests, is the dimension of silence, which he figuratively describes as the “silence around the words.” Absent that silence, much of our speech amounts to very little. In Fr. Rohr’s view, silence is more than an absence of sound. Silence, he asserts, possesses an “ontological identity,” which is to say, it is a being in its own right. Most of our speech, for good or ill, is “ego-based.” The ego uses words to get what it wants, employing argumentation, judgment, and analysis toward that end. Used in those ways, language is innately dualistic; it emphasizes preferences and differences. By contrast, silence “absorbs contradictions.” It is a “wholeness of being” that “holds the contraries in a way that words cannot.” When silence is absent, “words take over,” producing a barrage of language whose purpose is to explain, sell, charm, persuade, punish, and the like. But when silence is present, “chaste, well-chosen words” can arise from the silence, words with silence around them. No longer based in a dualistic, “either/or consciousness,” such words “open a portal to a deeper connection,” both with the world of things and with other people. In these lines an attentive grandfather listens to the inarticulate sounds his granddaughter is making. Hearing them as a melody, he likens that melody to a waterlily on the verge of flowering. Just as Maisie’s “speech-melody” has arisen out of the quietude of early morning, her first words are soon to emerge as the flower of language. Longley’s haiku-like poem is at once a loving study of a child and a contemplation of the mystery of silence, sound, and language. By leaving much unsaid, Longley’s spare words evoke the silence around them. Zen has been called the study of silence. The practice is more than that, of course. But by sitting still, even for the space of twenty minutes, we can allow our minds to settle and our inner chatter to diminish. Resting in open awareness, we can sense the eternal silence beneath the onrushing images, memories, and other mental phenomena. By making that silence the object of contemplation, we can witness the arising of thoughts and their emotional subtexts from the depths of silence and the ocean of consciousness. And should we then choose to speak, our words are far more likely to connect us with nature, ourselves, and other people, whether our subject is the appetites of Baltimore Orioles or the murmurings of an awakening child. 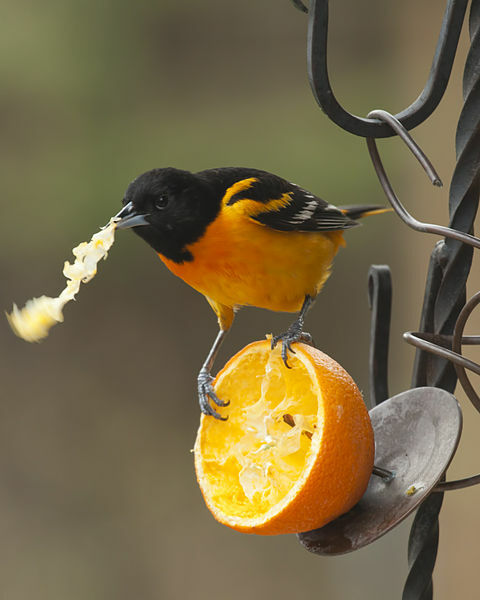 Photo: “Baltimore Oriole Eating Orange,” by John Kees.